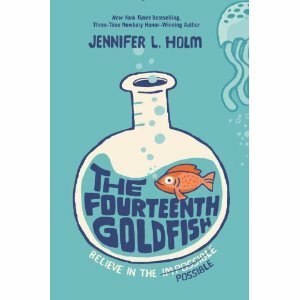 I thought about going with fourteen adjectives to describe Jennifer L. Holm’s recent release, The Fourteenth Goldfish, but then decided it is doesn’t need a gimmicky introduction; it stands strongly on its own as a great work of young adult fiction that pushes readers to think more about science, consider the possibilities of reverse aging and wonder just how much age plays into a person’s role within their family. While this book definitely skews to the younger side of young adult fiction, aimed primarily at the sixth/seventh grade levels, it is a fantastic find for science teachers since it introduces some great characters from the history of science and questions the role of scientists in all of our lives. It was a bit shocking that Ellie’s kindergarten teacher thought it was a good idea to teach young kids about the circle of life by giving them a pet store goldfish with a lifespan of a week so they could learn about death. That seems like a bit of a harsh way to crush the innocence of a child, but Ellie’s miracle fish lives for years, outlasting all of the other kids’ aquatic pets. I giggled when Ellie’s mom fesses up to having used replacement fish for year, sneaking the dead one out of the bowl and plopping a new on in its place before Ellie can discover that her initial goldfish wasn’t special and didn’t outlive those of her classmates. Soon though, the goldfish-incident is forgotten, when Ellie’s mother brings someone new home to stay. Dressed in a sweater vest, perfectly ironed khakis and black dress socks, Melvin just doesn’t blend in with other kids his age, but Ellie has a strange sense of knowing this odd new addition to her home. But why wouldn’t she? Instead of being another sixth grader debating between the corndog or the pizza for lunch, it turns out Melvin is actually Ellie’s grandfather! Melvin, a scientist, through the help of some fisherman friends in Australia, has discovered how to reverse the aging process, using himself as the guinea pig in his first human experiment with what can only be described as science-fiction come to life. Since no one knew what he was working on and he now looks like any other pimply kid on the brink of being a teenager, access to his lab is denied, and he can’t drive a car or live on his own without raising suspicions. His daughter (Ellie’s mom) takes him in, but makes him attend middle school as part of his cover, where his multiple graduate degrees make sixth grade science something he could do during a nap and fitting in nearly impossible. Stuck with Melvin, her grandfather, Ellie begins to realize that she isn’t cut out for the life of an actor like her parents, but rather that she has a keen interest in the experiments her grandfather has worked on and maybe her place in this world is wearing a white coat in a lab rather than an ornate costume on a stage.